So a couple of years back I created a thread gauging interest on who would be interested in buying S-Chassis specific PS fittings. I've been in contact with a manufacturer who will make the PS fittings, and before I go all in I want to see if members would be interested. The S-Chassis specific PS fittings will be made in brass or steel. I'm leaning towards brass to avoid rusty fittings. I'm avoiding aluminum since I've experienced aluminum fittings snapping on me. The reason I've looked into this was that I was tired of my steering rack always leaking ps fluid, because of fittings that came in my kit were to short. I tried everything to stop the leak, like slapping a bunch of sealant on the threads, crush washers, washers with rubber seals, and different fittings. None of that worked and my rack still leaked. I was fed up so I ended up making my own fittings from the original lines and welding them to -6an bungs. Since, I've done that I haven't had one single leak for over a year. Now I'm looking into having fittings made and wanted to see if the community would be interested in something like this. Thanks for the heads up. As for that banjo fitting, try a 16mm x 1.5 fitting to 6an. That's what I'm using for the pump but I'm still using the banjo itself. Curious why they're sold in pairs when typically the one to leak is the high pressure line going into the rack. Edit: not to burst your bubble, but chasebays offers a revised fitting which you can buy on their website for like $10. I have a comparson picture between their old fitting and their new one and the middle is definitely thinner to let the o ring get further into the rack. If I recall, there was about an .080" difference between fittings when I measured. to the OP: I use a steel fitting at the rack that you can actually put some torque into and it's given me zero issues. 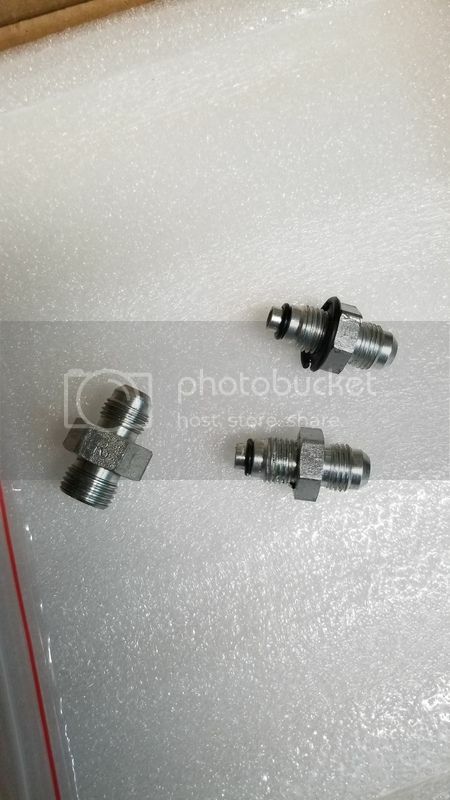 I just took a look at their revised fittings and it looks the same as the ones that I was provided. When I had the issue chasebays did send me a different set, but it still leaked. When my rack was leaking I had a leak come from both the high and low pressure line. Once I welded bungs to my old lines my leaking problem went away. What I'm going to sell will be both PS fittings with o-rings. The low pressure side will be an o-ring fitting as well. I want to ensure I provide something that ensures there are no leaks. 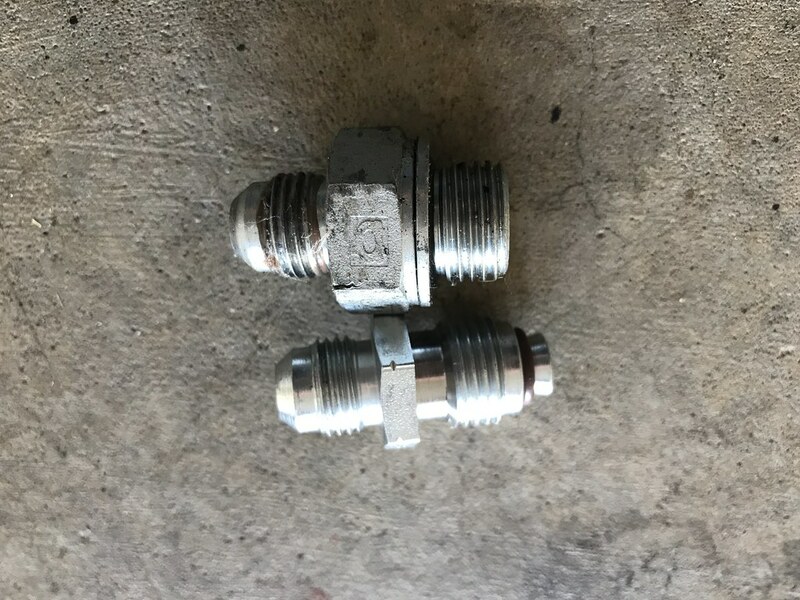 I attached pictures of my old fittings for comparison. I've thought of getting steel fittings, the only issue I considered was it rusting. I'm thinking about people out in the east coast. I had set in my mind that brass would help with the rust issue. weld AN fitting to stock fitting. Didn't say they never leak for people, I said it's not the most common one to leak. 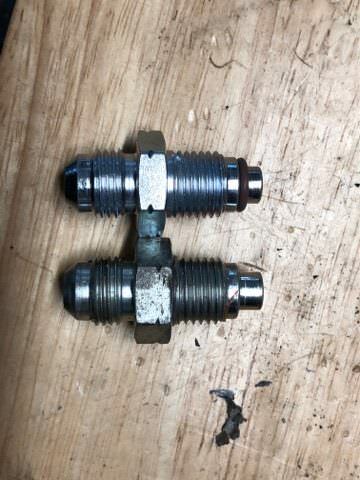 Comparison shot of my chasebays fittings. One thing to note: in a quick 10 sec search via Google, I uncovered no fewer than 5 companies which either make the line(s), the proper (longer) fittings or both as a package (and this is outside of ISR and ChasBays). The $70 set on here is just outrageous. I think I saw the set as cheap at $22 + shipping (so maybe $30 total). Albeit AL fittings. also interested in low side fitting. As far as kits, I've used the ISR one with their rack fitting and haven't had any issues at the rack. The PS pump side washer/seal is garbage though. Leaked immediately. I used a copper washer in front of it and it worked. 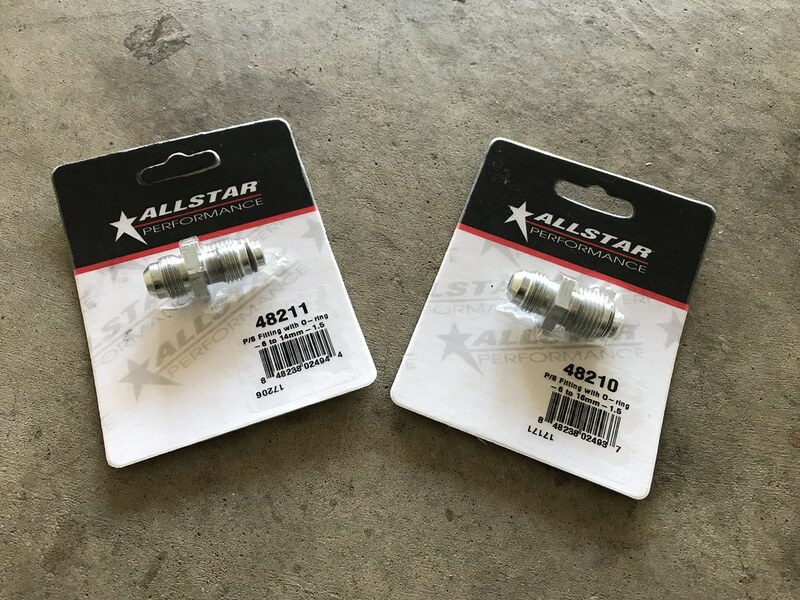 Yea dudes, here is a pair for cheaper than I can get fittings prior to re-oping. These didn't exist a couple years ago. They look like they would fit and seal pretty good. Anyone try them yet? I purchased some about a week ago, quality seems really good. Have yet to actually try them out, still rebuilding my car, but can't wait to try them out. I've seen that company, and the fittings look great. I'm interested in fittings other than aluminum. I've had bad experiences with AL fittings. If the oring is sealing properly, there's no need to crank the fitting down so tightly to seal on a crush washer. Thus you shouldn't be stripping or snapping off the fitting. 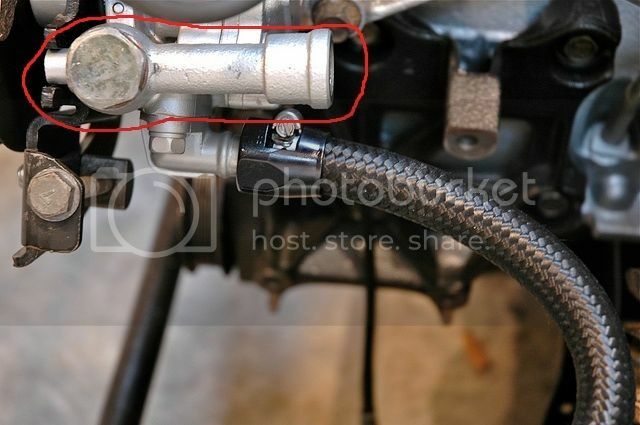 So is it common practice to keep the high pressure line connector to the pump or to remove it? I usually see it done both ways as the fitting usually supplied with most kits can be installed into this connector, or you can remove it and install straight into the pump itself. 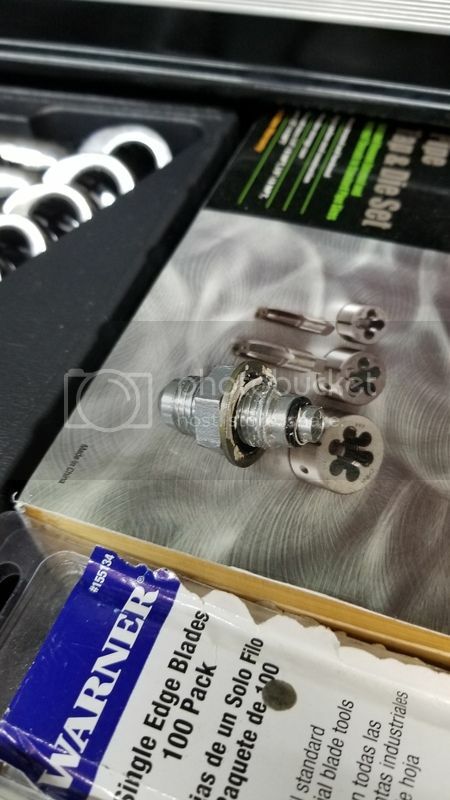 Thing is I believe the banjo bolt securing the connector to the pump is actually also a pressure regulator. Would be interesting to find out if people with PS issues did or did not retain it. I have replaced it before but its a pain to keep it from not leaking vs. over tightening... I have usually retained it in my rebuilds. The cast iron pump output is needed. I ditched it and used a fitting straight off the pump and it killed the thing over the course of a couple of months. Not sure what its real purpose is, but it's needed. These look like they would do the trick- good find. This is a good thread- will solve a lot of people's headaches for sure! Everybody here is mad this didn't exist in previous years.